I am impressed Kalyani, with the pumpkin puree and your kid!..way to go..:)..bajji looks really so colourful! Woah.. I am definitely trying this! I just LOVE Pav Bhaji. Every time I go to Chembur station, I HAVE to go to Sadguru! :D Maybe using Pumpkin will make me feel better about adding calories! :D Is there any difference in taste? Woww... looks so tempting and delicious.. thanks for sharing dear !! super cool idea, btw must have been quite an experience cooking with ur kid, i am so envious. Wow,thats surely an incredible twist to the usual bhaji,very creative,thanks for sharing Kalyani..
Woolah.. with pumpkin its an awesome.. recipe.. bookmarked.. Wonderful idea,with pumpkin...delicious and yummy. looks delicious...and lots of veggies that I love...thank you for no eggplant..will definitely try this one..its bookmarked! love the richness in the bhaji!!! Will try adding pumpkin puree the next time i make it!!!! 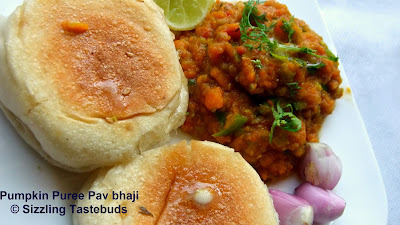 Nice use of butternut squash and the pav bhaji looks inviting. My fav..looks so good..fell like having it right now..
wow..low fat pav bhaji..great idea of using pumpkin instead of potato..very healthy and delicious..loved it!! @ kavi - there is no change in taste, but this has a different texture. But the dry masalas when added in the right proportion, does make it extremely good ! 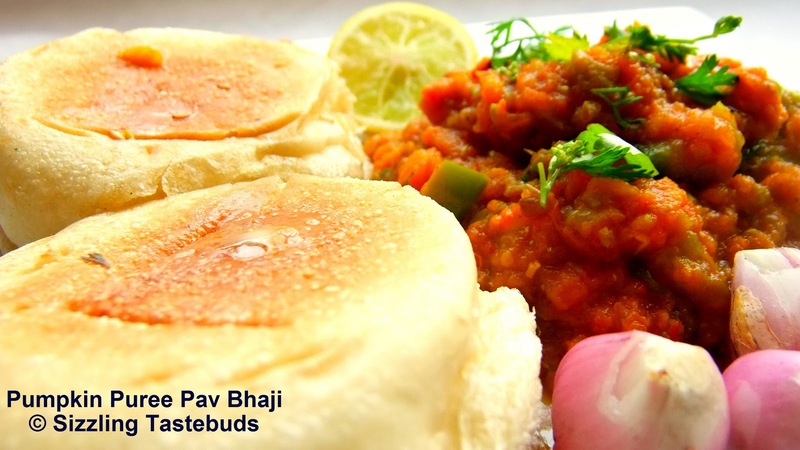 Do try it out, its surely different from the Sadguru's pav bhaji version, but definitely low cal ! Addition of pumpkin puree is interesting. I'm sure it tasted great, especially with the little one helping.